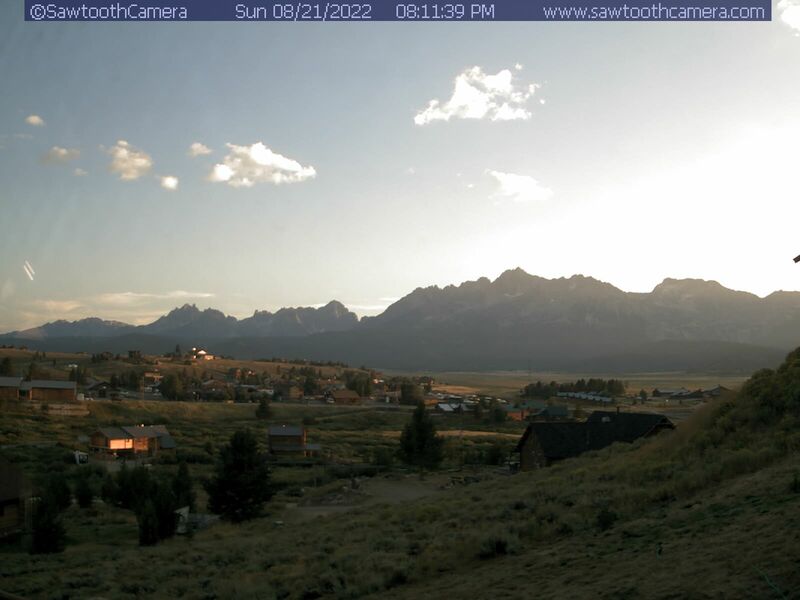 Sawtooth Camera: Live webcam from Stanley, Idaho. Views of the Sawtooth Mountain Range. Enjoy the beautiful Sawtooth NRA while helping to maintain it - become an Austin Kraal Memorial Volunteer. Visit www.sawtoothsociety.org/getinvolved to sign up. Connect with the Sawtooth Society on Facebook. Visit the Sawtooth Interpretive and Historical Association's (SIHA) website: www.discoversawtooth.org See the new SIHA Redfish Lake Webcam and learn how you can help support their efforts. Connect with SIHA on Facebook. Camera image updates every 10mins durring daylight hours. Camera is located in Stanley, Idaho (elev. 6250'), north of Valley Creek and aimed SW. The highest point in the center of the image is Williams Peak (10,635' and about 5.5miles away). Thompson Peak (10,751'), the highest in the Sawtooth Range, is just beyond Williams Peak. Click on the image below for a small Sawtooth Range panorama with several peaks labeled. If you're interested in visiting Stanley for your Idaho vacation, please visit the Stanley Chamber of Commerce webpages. They have information on Stanley hotels and resturants, Salmon River whitewater rafting, snowmobile rentals, hunting and fishing guides and outfitters, and Central Idaho real estate. Visit the Sawtooth National Forest and Recreation Area for info on Idaho's Sawtooth Mountains, as well as current camping, hiking, and backcountry information. Sawtooth Camera uses third-party advertising companies to serve ads when you visit this website. These companies may use information (not including your name, address, email address, or telephone number) about your visits to this and other websites in order to provide advertisements about goods and services of interest to you. If you would like more information about this practice and to know your choices about not having this information used by these companies, click here.